A rear fish under that rock | Flickr - Photo Sharing! We asked several dive masters what this fish was, but they did not seam to agree. Any one knows? Nice shot.... it's a Spotted Drum. They're very shy and are usually to be found hiding under a ledge, as in your photo. It's an Adult Spotted Drumfish, the Juvenile does not have the spotts like that. Spotted Drumfish yes, the juvenile is even more fantastic with a enormously long first dorsal fin and tail fin. 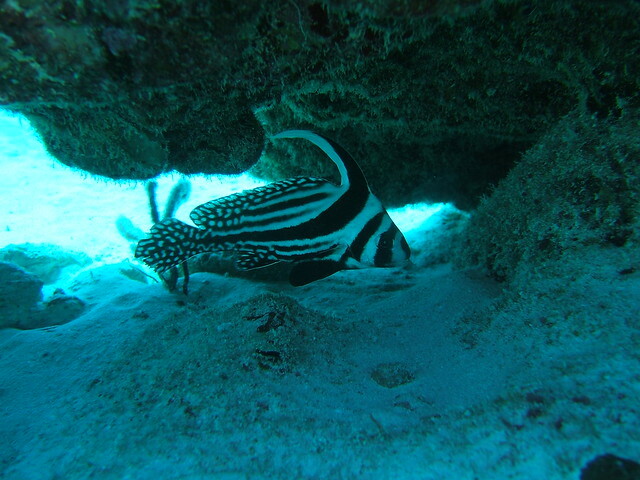 Another sweet pic, actually I'm thinking about buying and underwater camera now since my other hobby is snorkeling. You should! and living where you live, get one down to 40m and start taking diving lesons. Your photography will get another dimension. Honest, you are living near some of the best diving areas in the world. to give you a hint: check the link under this picture: www.toga.cc (diving gallery) It's on your doorstep mate!